2-inch PRO 46 COLORED MASKING TAPE - is a multi-purpose 6-mil thick solid-colored crepe paper masking tape with a low gloss finish. 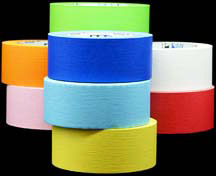 It is ideal for box labeling and color-coding, bundling, and for temporary court lines on gym floors and carpets for games like awana and 4-square (awana colors are blue, green, red, yellow, and white). Pro 46 colored masking tape can be written on with permanent markers and does not bleed through, and it is easy to remove. Available by the roll or by the 24-roll carton. Plastic: for 2-inch Masking Tape.